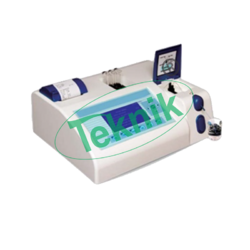 Microteknik provides you with the best range of Analytical Instruments such as Bio Chemistry Analyzer, Digital Viscometer, Digital Blood Cell Counter, Digital Tele Thermometer, Digital Automatic Polarimeter, Digital Automatic Melting Point Apparatus, Precision Digital Melting Point Apparatus, Digital Photo Flouri Meter, Microprocessor Based Conductivity and TDS Meter, Microprocessor Photo Calorimeter, Microprocessor pH / Temp / MV Meter & Deluxe pH Meter. Range 0 to 1000 m mho in 6 ranges. Range 0 to 1000 ppt in 6 ranges. Range 0 to 50 ppt. Display 16 character 2 line. alphanumeric LCD. Interface RS-232, Centronics & Computer. Error indication T-ERROR, CAL ERROR. Digital Display 3 ½ digit LED. Power 220V AC ± 10% 50Hz. Accuracy ± 0.02 pH±1 digit. Slope Correction 80 to 120%. Range 0 to 20mS/cm in 5. Temperature Comp. 0 to 50°C Manual. 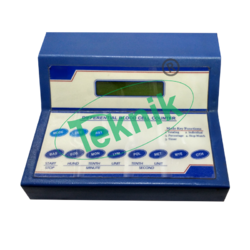 It has the advantage of high accuracy, stable digital display, easy to operate and good anti-interference. 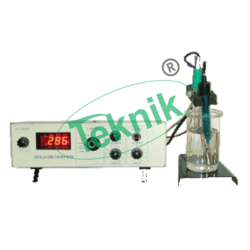 It is widely used in the measurement of viscosity of various kinds of fluid such as grease, paints, food, medicine, adhesive and cosmetics. etc. 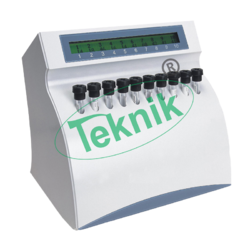 It can also be used to determine the viscosity resistance and absolute viscosity of the liquids. Its with led display. 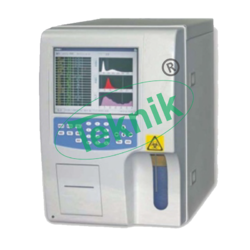 Measurement range is 20- 20,000,00 mpa.s with 0.3 to 60 RPM, 4 Spindle. 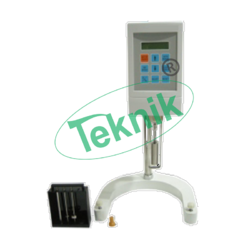 Provided with rs232c interface. 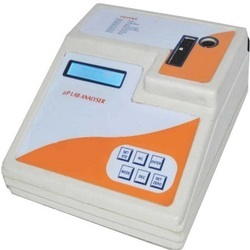 Automatic ELISA plate analyser with user friendly and sophisticated on board software. 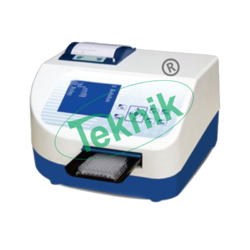 It is a stand alone system for all routine immunoassays, Biochemicals, hormones and drug levels. Its versatile and extensive software supports most of the calculations required for interpretation of results. 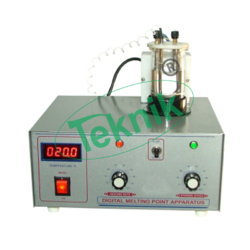 It is economical, reliable and high precision machine. Power 50 watts/115 230 Volts ± 50/ 60Hz. Robust system with built-in stabilizer. Built in Shaker with variable speed & duration. Results printing in matrix mode format. Option to run multiple blank in Cut-Off mode. Ability to read from any strip in a single plate. Photometric Accuracy ±2% or 0.007 whichever is higher, from 0 to 1.5A, ± 3% from 1.5A to 3.0 A. Wave Length 340, 405, 510, 546, 578 and 630 mm & two Optional flow cell. Dry Block Incubator 15 positions at 37 C.
Temp. of Cuvette/Flow Cell Block 25 C, 30 C and 37 C by Peltier effect. Storage Capacity Open tests with 30 QC results/test & 2500 Patient results. Sophisticate software for kinetic graph with built in delta calculation for saturated (high) samples from graphic display without diluting and rerunning the samples. 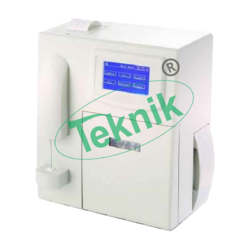 Reliable peristaltic pump with maintenance free operations. Unique circuitry for long lamp life. Robust system with built in stabilizer. Levy Jennings and standard deviation graphs. Patient report with PID & Name. Range 400 to 700 nm. Wave length range : 400 to 700 nm. Resolution ; 1%T, 0.01Abs., 0.01 Conc., 0.01 K Factor. 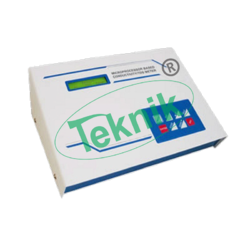 %Transmission: 0 – 100% T.
Absorbance : 0 – 1.99A. Concentration : 0 – 19999. K Factor : 1 – 19999. Photo detector : Silicon Photodiode / Photo Cell. Display : 16x2 line alphanumeric LCD display with backlit. Keyboard: 8 Keys, soft touch membrane keys. Data storage : Up to 100 Samples. Light source : 6.8V, 0.3Amp. Tungsten lamp. Sample system : 10 mm path length matched glass test tubes. Filters : 400, 420, 480, 500, 520, 540, 620, 680 nm. 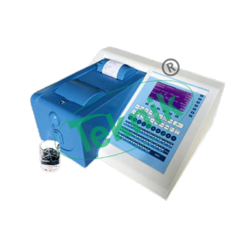 Printer interface : Centronics parallel Printer interface for any dot matrix printer. RS232 Interface : Available (On Request). 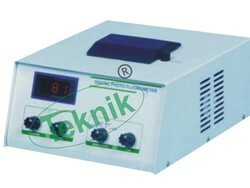 Power supply : 230V AC ±10%, 50Hz. with in-built Stabilizer. Accessories : Matched Test Tube Set of 5, Operation Manual, Dust Cover, Spare Lamp. 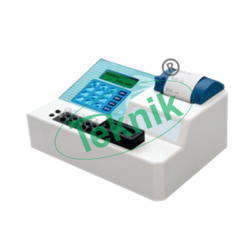 Looking for Analytical Lab Instrument ?